Ideal pumps for press operation: up to 400 tons, with 1.6l of oil delivered per minute. High torque, low speed pumps designed and manufactured specifically for industrial applications with extended cycle operation. Even under full load the pump can be started and operated, when the voltage is reduced as low as 10%. Quiet operation, below OSHA noise limitation. * Manual valve. Pump is equipped with RUN/OFF/PULSE switch for control of motor. † Solenoid valve. Pump is equipped with a remote control switch with 3.1 m cord. 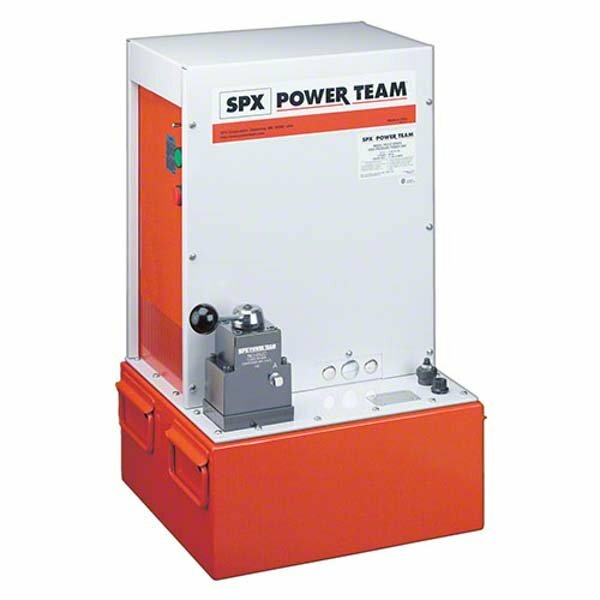 ‡ Some Power Team pumps are available in special configurations not listed in this catalog. Power Team can "Assemble to Order" pumps with special seals, voltages, valves, relief valve settings, etc. For your special requirements please contact us. Pump’s motor is 3 phase, 380 volt, 2.24 KW, 50 Hz although other electrical configurations are available.